TEDMED Great Challenge continues. Join us today for the live Google Plus event. 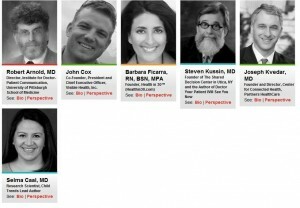 Tune in today February 14, 2013 at 3:30 p.m. EST at TEDMED.com and ask your questions. We’ll answer them during the live discussion. John Cox – Co-Founder, President and Chief Executive Officer, Visible Health, Inc.
Physicians are not typically trained in interpersonal communications and are not rewarded based on their communication skills. Equally important, patients are often intimidated when talking to doctors and often feel they don’t have a receptive audience, especially when doctors are rushed. What can be done about this on both sides of the challenge (patients and doctors) — including possible initiatives in areas ranging from education to technology, to possible changes in the physical workspace? How do we make this issue a priority? That will be topic we’ll tackle with TEDMED during a Great Challenges live event on Thursday at 3:30pmEST. Tune in to TEDMED.com to ask questions, watch us discuss this issue, and give us your thoughts.